All of our family are passionate about wildlife and have been watching Springwatch avidly over the last 3 weeks, on one of their programmes they were encouraging people to take part in a survey to monitor the Hedgehog population by putting food in a friendly ‘trap’ this reminded me of the project that myself and Thomas did in February to detect whether we had mice in the greenhouse. Most winters mice take up residence in my greenhouse there are many potential nesting places amongst the empty compost bags, fleeces and plant pots/seed trays, one year I even found a nest in the middle of a large ball of string it was very cute, although I love all creatures great and small mice can be very messy and smelly, they are definitely not toilet trained and have been known to nibble my young seedlings, so during the school holidays for a bit of fun we made a Mouse detector. Thomas’s dad made a wood tunnel using off-cuts and with a removable top (although this is not necessary) it measured approx. 40 x 15 x 15cm externally. Cut your white paper to fit in the bottom of your detector. If you are using a cardboard box cut two small holes at opposite sides of the box at ground level. Cut two small pieces of greaseproof paper to fit across your openings at least 4cm deep and glue or staple down. 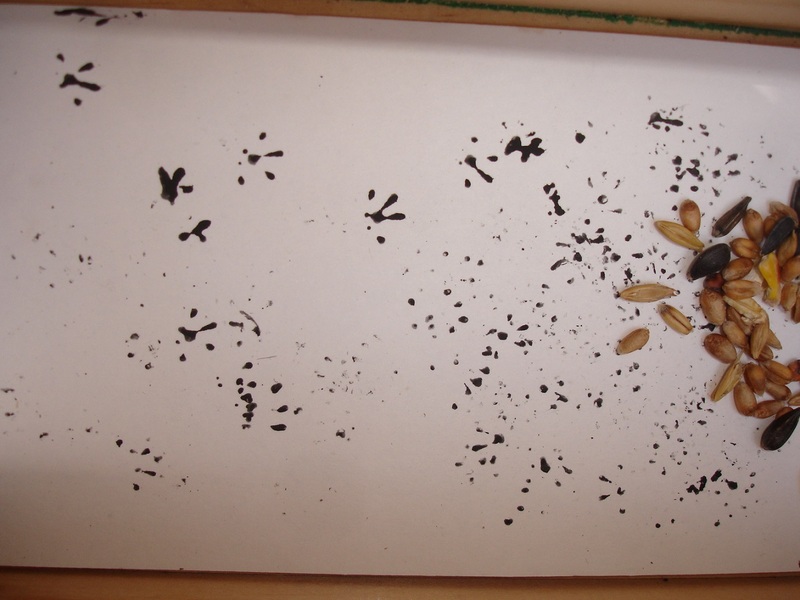 Mix your poster paint with an equal amount of vegetable oil and brush generously onto the greaseproof paper. Place your tasty snacks in the centre of the sheet of paper. If you are using a plastic pipe or wood tunnel staple the greaseproof pieces at either ends of your paper, apply your paint, put your snacks in the centre of the sheet and slide carefully into the pipe/tunnel. 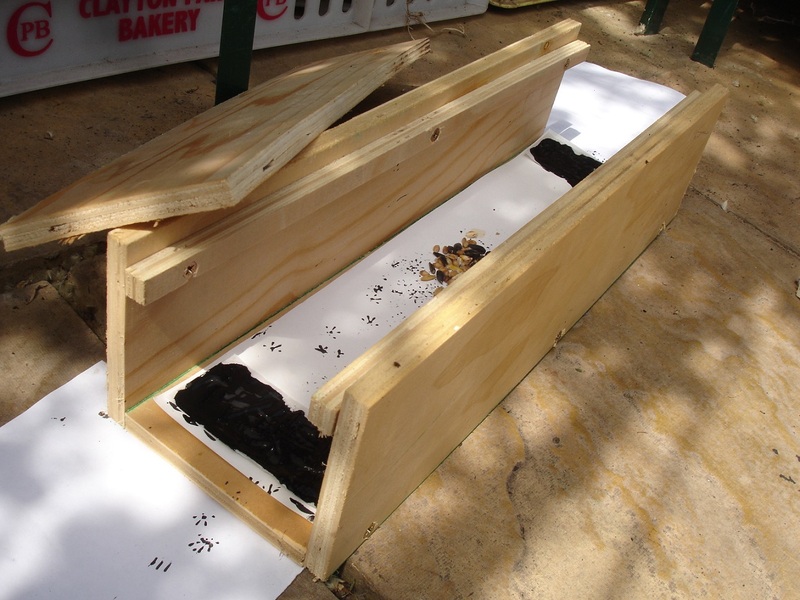 Place your traps at the bottom of a wall, fence or hedge before you go to bed at night, any visitors tempted by the food will walk through the paint and leave their footprints on your paper, we found that it is a good idea to place sheets of paper on the outside of your trap (if the ground is flat) as the mice will walk through the paint again before leaving, use a cardboard box on dry evenings or inside a greenhouse/shed/outbuilding as they are not waterproof. We indeed did have mice, they were nesting in some old bird boxes that were being stored in the greenhouse I temporarily blocked the holes up with some old socks whilst I moved the bird boxes complete with mice to a corner of my allotment, unfortunately my kindness has back fired I think that the hungry mice have been helping themselves to my newly sown peas as very few have germinated!